Shardul Vihan after winning silver medal in the Men’s Double Trap event at the Asian Games. So far, four of the 25 medals Indians have won in Indonesia have gone to teenagers. 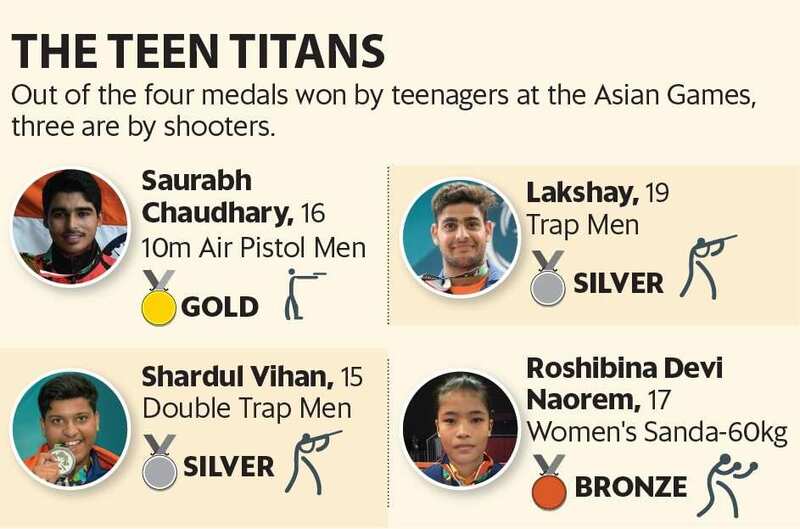 New Delhi: Shardul Vihan, all of 15, on Thursday became the youngest Indian to grab a medal in shooting events at the Asian Games after winning the silver in the double trap final in Indonesia. Two days earlier, Saurabh Thakur, 16 and like Vihan also from Meerut, won the gold in 10m air pistol men’s final. So far, four of the 25 medals Indians have won in Indonesia have gone to teenagers. Three of them have come in shooting, which has become a mainstay for India in global multidisciplinary sporting events. Through the year, yet another teenager, 16-year-old Manu Bhaker from Haryana, has won a medal at every competition she has participated in. Bhaker missed out on one in Indonesia but teenage athletes are adding a new shine to Indian sporting dreams in almost every discipline. In July, Hima Das, 18, won India’s first gold medal at an international track event. And earlier this month, the Indian Under 20 football team defeated Argentina in a COTIF Tournament match. Around the same time, the U16 boys defeated Jordan, Yemen and Iraq in the Waff Cup. Earlier this week, Prithvi Shaw, the 18-year-old opening batsmen from Mumbai who led the Indian team to victory in the U19 World Cup last year, was called in to replace the seasoned Murali Vijay in the Indian cricket squad touring England. One reason behind the success of the young Indian athletes is the much- improved sporting infrastructure. “The support system for athletes is much better now," said Olympian and former captain of the Indian hockey team Viren Rasquinha. “They also have tremendous self-belief and the credit for that should go to older athletes like Vijender (Singh), Abhinav (Bindra) and Saina (Nehwal), whose success has inspired a whole new generation," he says. Moraad Ali Khan, former shooter and Arjuna awardee of 1996, who is now a national selector, agreed. “Be it (Ravi) Shastri or (Sunil) Gavaskar in cricket or the likes of Abhinav Bindra and Samaresh Jung in shooting, the strength of the seniors has to be utilised properly." More importantly, perhaps, parents are opening up to the idea of their children playing sports as a career proposition. An institutional boost has come from the Union government’s ‘Khelo India’ initiative to encourage sports among the youth. Under the programme, 1,000 athletes are being identified across sports to be given annual scholarships of ₹ 5 lakh each for eight years. funds to create world-class sporting facilities. Private sector participation in sporting infrastructure and grooming athletes gives India’s effort the final flourish. Last week, the Jindal Group opened its Inspire Institute of Sports in the mining district of Bellary in Karnataka, billed as the country’s first privately-funded high performance training centre for athletes. “The ultimate goal is to produce more Olympians," says Mustafa Ghouse, chief executive officer, JSW Sport. “Not all of these children might make it to the Olympics but they are definitely getting more exposure and I am sure such initiatives will change the lives of our young athletes."